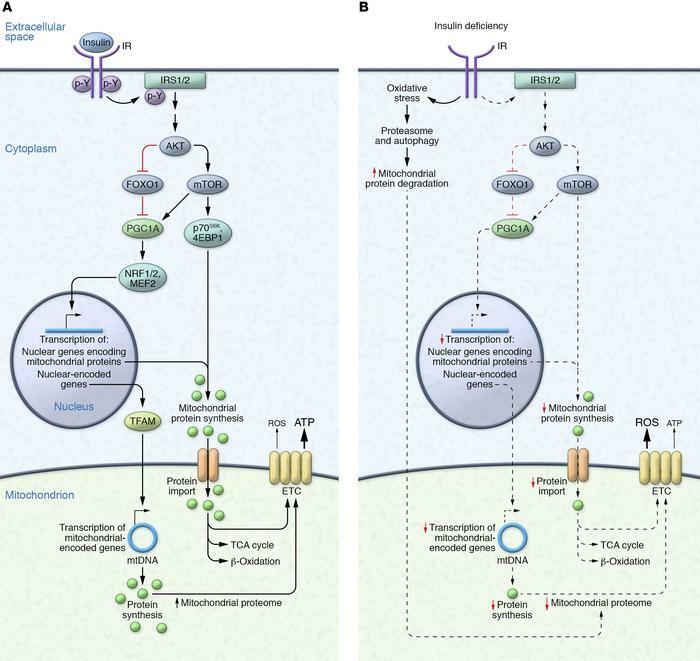 The mitochondrial proteome in the presence and absence of insulin signaling. (A) Insulin binding to the insulin receptor (IR) initiates a downstream signaling cascade leading to the phosphorylation of insulin receptor substrates (IRS1/2) and activation of AKT, the major node of insulin signaling. Of the many downstream effectors of AKT, the inhibition of FOXO1 influences the expression and activity of PPARγ coactivator 1α (PGC1A), which activates transcription factors (e.g., myocyte enhancer factor 2 [MEF2], nuclear respiratory factor 1 [NRF1], NRF2) that control nuclear-encoded mitochondrial gene expression. PGC1A also enhances the transcription of mitochondrial genes through transcription factor A, mitochondrial (TFAM). In the presence of appropriate amino acid concentrations, activation of mTOR and its downstream targets increases the synthesis of nuclear-encoded mitochondrial proteins in the cytoplasm, which are imported into the mitochondria to form TCA cycle, β-oxidation, and ETC complex proteins. Mitochondrial-encoded genes are synthesized in the mitochondria and form ETC complex proteins. Collectively, these increase the mitochondrial proteome and ATP production. (B) Insulin deficiency decreases the transcription of nuclear-encoded and mitochondrial-encoded mitochondrial genes and the synthesis of mitochondrial proteins, and increases oxidative stress and gene expression central to the proteasome pathway (e.g., the E3 ubiquitin ligase TRIM63) and autophagy pathway (e.g., Beclin), leading to increased degradation of mitochondrial proteins. Collectively, these responses decrease the mitochondrial proteome and ATP production. Additional abbreviations: 4EBP1, eukaryotic translation initiation factor 4E–binding protein 1; p70S6K, 70-kDa ribosomal S6 kinase.